Breathe in. Breathe out. Looking for a way to bring the outdoors in? To clean the air without the constant hum of an air purifier? 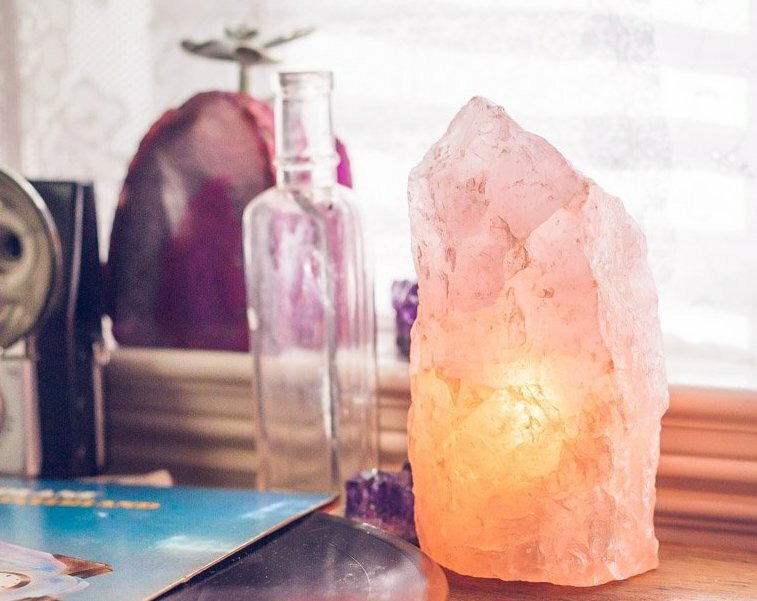 Himalayan Salt Lamps are the perfect way to add an earthy, designer kick to your home while offering a host of health benefits at the same time. But, before we get into the benefits (and how to recognize and source high quality lamps), what exactly is Himalayan salt and why would anyone throw electricity into the mix? True Himalayan salt is sourced from the Punjab region of Pakistan, specifically Khewra, located on the western edge of the Himalayan Mountains. Himalayan salt, typically pink or orange-ish in colour, is a great food additive (and substitute for traditional iodized table salt) due to its high level of trace minerals and electrolyte balancing capabilities. Himalayan Salt Lamps are simply large, carved blocks of this uniquely sourced salt, hollowed in the center and fitted with a small light bulb. When lit, rich, amber-tinted light is cast throughout your space and this is when and where the magic happens. Himalayan Salt Lamps provide an alternative, amber-tinted light source, especially beneficial after sunset, when used as a replacement for LED lights and blue light-emitting technology. From smart phones to late night binge-fests of The Bachelor (who doesn’t love good ol’ Reality TV? ), we are more susceptible to sleep disturbances and disrupted circadian rhythms than in any other time in history. Rather than allowing our bodies to follow the normal patterns of the sun, with the brightest light we experience between approximately 11am and 1pm and tapering off in both directions, we continue to program our body clocks to receive bright, unnatural blue light well past what our ancestors experienced. This dramatic shift in light exposure has wreaked havoc on our health, the most prominent impact being a sharp decline in melatonin production. And don’t just think of melatonin as that pill you pop when you’re jet-lagged. Naturally produced melatonin, as a byproduct of healthy circadian rhythms, has far reaching, system-wide benefits for your health from cancer prevention, to immune-modulation, and beyond. Decking your home out with Himalayan Salt Lamps, and using these especially in the evenings, provide a more natural light and color spectrum which allows your body to better settle into healthier circadian rhythms. In theory, Himalayan Salt Lamps improve the air quality through a process called hygroscopy. When turned on, Himalayan Salt Lamps attract airborne water molecules, moisture and those indoor air pollutants (like mold) that are trapped in water vapor. When the water vapor comes in contact with the salt lamp, impurities are believed to remain there as the lamp heats and dried salt is formed. This cycle continues, and air is cleaned, though more slowly than a traditional air purifier, in the process. Did you know that we are swimming in a metaphorical sea of electrosmog? Top offenders are WiFi, your television, smart phones, iPads, and the constant bombardment of modern technology, all of which produce positive, inflammatory, ions. Himalayn Salt Lamps are said to emit low levels of negative ions, which help to counterbalance our constant exposure to positive ions. A walk on the beach, a hike in the forest, and just getting away from technology is equally impactful, but Himalayan Salt Lamps offer benefits when our lifestyles don’t allow for regular and intentional time outdoors. Not all salt lamps are created equal. True Himalayan Salt Lamps should be somewhat fragile (keep in mind, they’re made of salt so should chip fairly easily). If you’ve sourced a lamp that boasts durability, then you’re likely not dealing with the real thing. True salt lamps should sweat when exposed to moisture, often forming a light crust near their base after continual use. If you’ve sourced a lamp that is not impacted by moisture or high humidity environments, then you’re likely dealing with a fake. They should be made of 100% Himalayan salt, should cast an amber-tinted hue, should contain heat-producing (not LED) bulbs, and ideally should mention Pakistan sourcing in their packaging. In Hong Kong, Staunton and Henry offers high quality Himalayan Salt Lamps. Gluten ◆ To Avoid or Not? The Wildery is a lifestyle, health and wellness brand. A collision of science, wellness insights and topics that inspire, it's Wellbeing for Your Whole Being™. Learn more. @2018 - The Wildery. All Right Reserved.